::Ella Belle Boutique::: CLOSED: WINNERS TO BE ANNOUNCED SHORTLY! One year on ETSY . GIVEAWAY!!! Spread the Love--Add a Button to your Blog! Welcome to Ella Belle Boutique! 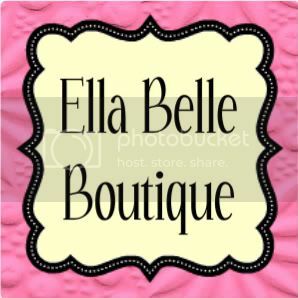 Thank you for visiting Ella Belle Boutique! I am so excited to bring you my one of a kind creations! I have loved to beautify, craft, and create since I was a little girl. Have fun exploring my endeavors and check back often for new items! ellabelle.boutique@gmail.com and we will get started! CLOSED: WINNERS TO BE ANNOUNCED SHORTLY! One year on ETSY . GIVEAWAY!!! I honestly can't believe it, but September 8th will mean I've been selling on Etsy for one full year!! I have learned so much along the way, and still have so much to do! I've met some amazing people through Etsy. I am so grateful for the opportunity to connect with those who love handmade and to be able to create something beautiful every single day! With all of that said, in celebration of my first year on Etsy, I am offering a wonderful giveaway for my loyal fans and customers! Winners will be announced Tuesday, September 15, 2009, on this blog! Become a follower of this blog for one more entry! Any orders made on September 8, 2009 will receive a free gift!!! My absolute favorite pair of earrings is Gilbert's Lily of the Valley earrings that I bought last February for my birthday. I wear them almost every day at work, and whenever I feel like looking pretty. But I also love all your Emily earrings -- I just read those books recently, and was tickled to find so many earrings for them in your shop. I foresee a Christmas present in my future. my favorite would have to be Marianne Dashwood! you are very talented! They are are very cool each in their own way! And I still have your link on my page! Congrats on the one year mark! I'm sure you'll continue to go strong for many more years! It's soooooo hard to choose just one thing that I call my favorite because ALL of your stuff is GORGEOUS! I want it all! I especially love the yellow rose earrings with matching ring! I don't even where very much yellow but I would start if I owned those! Jessica, I didn't even know you made jewelry. I love your earings. My fav is Marianne Dashwood. I just love the hollywood glamour designs! I linked your give away to my blog...take a look at mine if you have a chance. I like the gorgeous Ellie . Classic Hollywood Glam . Octagon. Lovely things! My favorite are: Ava . Gorgeously Glam . Classic Hollywood Glam Earrings. Congrats on your one year on Etsy, and thanks for the opportunity! My favorite is Ingrid Luxe Lilacs earrings. Happy Etsyversary! I love the Irene Classic Hollywood earrings. I love the purple! Enjoyed your shop very much! Thanks for sharing! Congrats on your one year anniversary with Etsy! I loved so many things, so hard to choose! But the Bluebell Necklace is probably my most favorite. Very pretty! 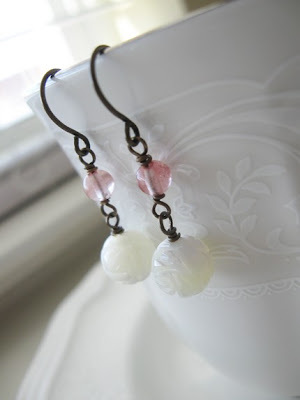 I love the Anne Of The Island Earrings-so very pretty! i love the audrey guilded age earrings! I love the "Ilsa" earrings! Are they named after Ingrid Bergman's character in "Casablanca"? They sure are Hollywood glam!!!! Thank you for the chance to win. I absolutely love the 'Cherry Blossoms . Emily Climbs' earrings. They are gorgeous!! I love the Pumpkin Spice earrings! Ohh, choosing favorites is so hard for me. I love the Emily in the Glass earrings and the Mr. Darcy's True Love necklace, but then there's the..... oh, I'd better stop! I put your button on my blog!! I love the Angelina . Luxe Ring . Gold Plate and Vintage Emerald Glass. i follow via google friend connect! Your jewelry is gorgeous! I love that it has a vintage feel to it. This is such a nice giveaway! thanks for the chance to win. and now I am following! can't wait to see future designs. I like the Joan Fontaine earrings. I love your Classic Hollywood Glam - Ellie. Please include me in your giveaway. I love the hollywood glamour line. I am in love with the Audrey . Classic Hollywood Glam earrings in gold. Stunning! I love the Irene . Classic Hollywood Glam earrings, so pretty, I love purple! I am on twitter and posted this giveaway on there! Posted this giveaway on Fecbook! I love the Ilse's Pink Peonies . Emily's Quest. SO Beautiful. Thanks for the Giveaway! Love the Hedy Earrings. Your shop is adorable! I love the Judy . Classic Hollywood Glam and Grace Dainty . Classic Hollywood Glam. Gorgeous!!! My favorite item is the Ava earrings!! I totally will choose the Greta earrings, i LOVE green! My favorite is Ilsa, gorgeous earrings. I love the simplicity and the colour of the Irene . Classic Hollywood Glam Earrings! You have many lovely jewelry creations in your shop. Many of the earrings are fabulous and I adore the Newfound Love Necklace! I posted your giveaway on Facebook. I follow your blog via Google Friend Connect! I love the From Me to You necklace. That blown glass is just stunning!!! Your earrings are all beautiful as well - I love the giant gems!!! Oh, and congrats on your Etsyversary!!! These earrings are gorgeous! I am thetinyfig on etsy :) Congrats on your one year! I just reached year 2 myself. It is SO tough to pick a favorite...your beautiful work is so unique. I just love the South Pacific Necklace. My fave are the Bette Luxe earrings! I love vintage Hollywood-style jewelry, it's so glamorous! Thanks so much for this wonderful giveaway! Pumpkin spice is so me! Please enter my name! The Joan Fontaine-Classic Hollywood Thriller Hitchcock Earrings stopped me in my tracks. Not only am I a huge Hithcock fan, but the earrings are gorgeous! Thank you! I love the Irene earrings and the Loretta filigree ring. Omg, I love these. I love the Olivia . Filigree Glam . Classic Hollywood Glam! I blogged. I love the South Pacific Necklace. It is just gorgeous! i just fell in love with the Loretta filigree ring--it's gorgeous! you have some BEAUTIFUL things! I loved so many things... just one of my favorite's is the Vintage Angelina . Classic Hollywood Glam earings! I like the South Pacfic Necklace. I tweeted your giveaway on Twitter today (daily tweet) Thanks! I love the From Me to You necklace! It's simple and perfect! Gorgeous! I tweeted your giveaway today (daily tweet) Thanks! My favorite (although it was very hard to decide and I loved a lot of them) was "And I Love Her." I will post about this on my blog and I became a follower. Thanks Jess-wow you have a TON of entries! Hope things are going well for you! I really, really like everything in your Austen collection. You make such beautiful and feminine things. congrats on one year!!!! I like the Avonlea Collection and the Jane Austen Collection. The South Pacific Necklace is beautiful!